Weather permitting, we may be able to see a bright iridium flare near some colourful stars tonight! An iridium flare is a man-made satellite orbiting Earth. Their antenna can reflect a lot of sunlight and make them shine very brightly in the sky. At its maximum brightness of about -8.4, it will even outshine the brightest Venus (-3.82), let alone the brightest star Sirius (-1.47). Seen visually with unaided eyes, the duration of an iridium flare is very short - the flash will be gone in 2 or 3 seconds. That is the reason why most people have not seen it before. You have to know such a thing exist, exactly where in the sky to look at and the exact time it will appear. And that patch of the sky have to clear at that moment! This is a video of an iridum flare captured beside Canopus, the second brightest star in the sky. What is so special about tonight's iridium flare? It is near a visible star (Mizar) which means it is relatively easier to locate. One does not need to locate the exact 34° altitude and 344° azimuth position in an apparently star-less patch of sky. But more importantly, its location will create an interesting view through a wide-field binocular or telescope because of Mizar! Mizar and its close companion Alcor are a pair of colorful stars through binoculars or telescopes. Mizar and Alcor are actually part of a six-star system. 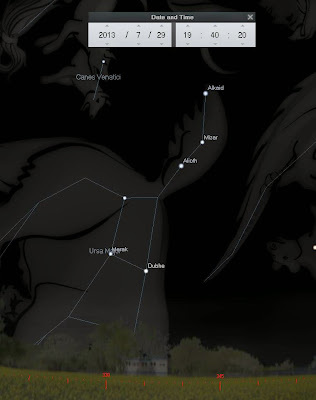 When the sky just starts to get dark at about 7:30pm, try to locate the Big Dipper asterism in the north. Mizar is one of the stars in the "tail" of the Big Bear or "handle" of a ladle as illustrated below. Clench your hand into a fist as if you are holding a flag upright and extend your arm fully. Mizar is about 3-fists high above the horizon. Get hold of a wide-field telescope/binocular which can give at least 4 degrees field-of-view and look at Mizar-Alcor through it. The iridium flare will appear slightly above and the to the right of Mizar-Alcor. Position this pair of stars so that there is sufficient space for the flare to be visible in the same field-of-view. The smallest white circle in the middle represents the iridium flare location. The red circles from innermost to outermost represent 0.5, 2 and 4 arc degrees in the sky respectively. In a binocular which shows the same orientation as unaided eyes, the flare will appear slight above and to the right of Mizar-Alcor as illustrated above. For telescopic views with involves different visual orientation (vertical and/or horizontally inverted views), please adjust accordingly so you know exactly where to position/look at in the field-of-view. Synchronise your clocks and start observing Mizar-Alcor latest by 7:40pm and hopefully you will see the bright flash beside the colourful stars! Imagine a person with no knowledge of stargazing or astronomy and happens to randomly look at a star (Mizar) tonight at the exact timing through a telescope or binocular. He/she would have seen a bright flash through the view of the optical instrument and upon putting down the instrument and looking at the sky, no such bright object could be seen by then! That person will most probably think it was an UFO travelling at an amazing speed! Thanks to the fantastic Heavens-Above website, anyone can find out in advance iridum flares and appearances of other man-made satellites for free. 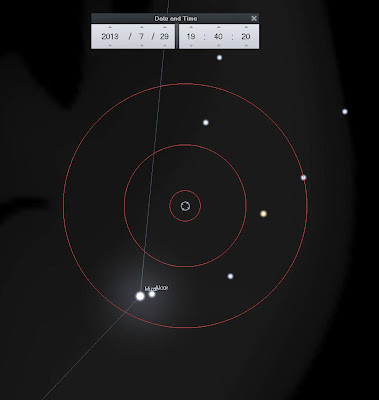 Do check out his wonderful resource and let us know if you find more interesting irdium flare + celestial objects conjunctions in the coming weeks and months! Wishing all of you good luck and happy hunting! 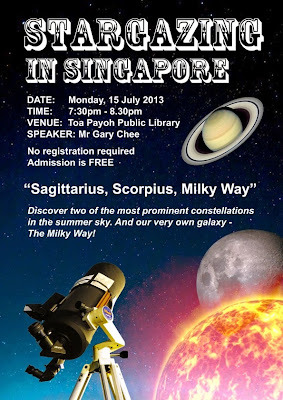 The next public talk I will be conducting is titled "Sagittarius, Scorpius and the Milky Way". 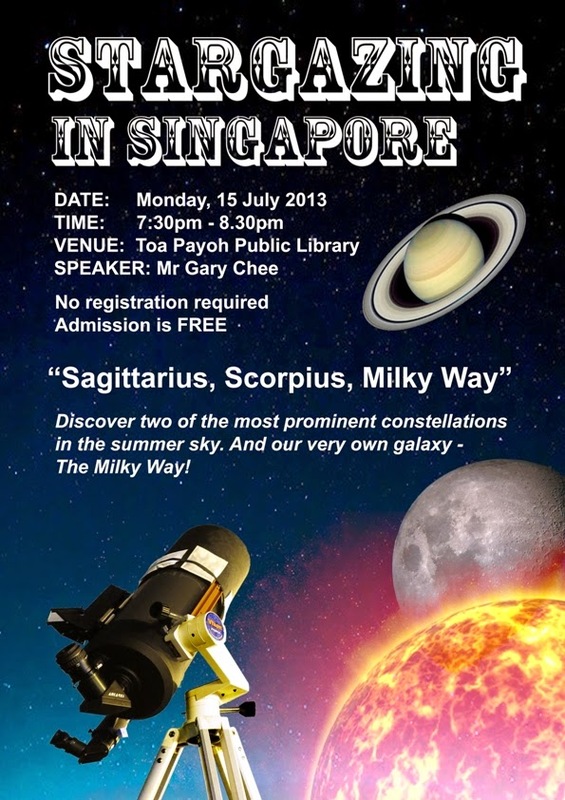 Participants will be taught how to identify and appreciate the two most prominent constellations and our Milky Way galaxy in the summer sky. A3-size printed star maps will also be distributed. Weather permitting, during/after the talk, there will be an impromptu live stargazing session at open space just outside the library. You can observe the Moon and Saturn through our telescopes!